Description :Overview : The MSP 9500 (earlier version of the Tecan MiniPrep 75 / Tecan EVO 75) Sa.. 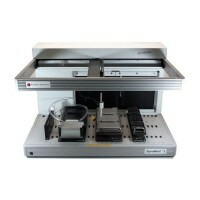 Description :Title : PERSEPTIVE BIOSYSTEMS MATRIX REAGENT TRAY (8) 11mm & (8) 8mm POSITIONSModel : M.. Description :Title : PerSeptive Biosystems Pipette Tip TrayModel : PerSeptive Biosystems Pipette Tip..